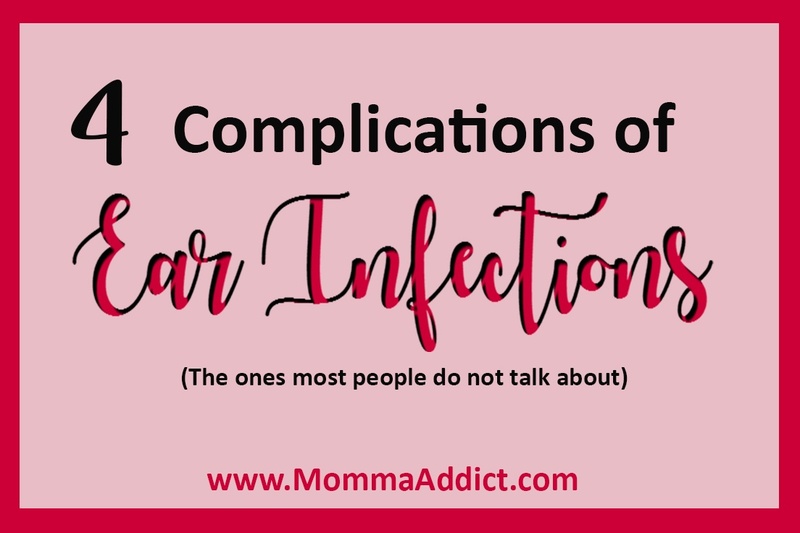 Ear infection complications can happen when the infections become severe or recurrent. I already discussed common myths about ear infections, and shared ear infection facts that I believe parents should know. Ear infection complications can be divided into the common and the uncommon types. Common ear infection complications include temporary hearing loss, speech delay, dizziness, balance problems and sensory processing and learning disorders. 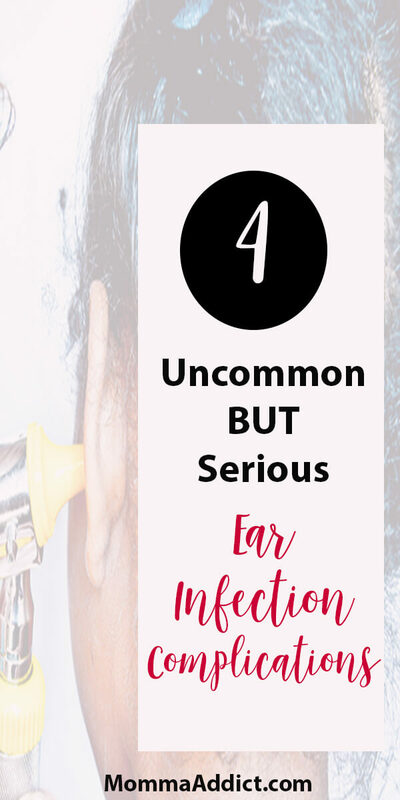 Uncommon ear infection complications happen because of long-term problems that have not been successfully treated or where symptoms seemed to go away. Without significant symptoms, it can be hard to know if a more serious problem is developing. When kids suffer from ear infections for many years, they get used to ear symptoms and stop complaining about them. Kids are tough! They often say: It’s not bad, and I can handle it. You do not want your child to “handle” ear problems. If your child’s ear infections do not happen as often as they used to, you need to understand that the ear problems should completely go away. If ear infections keep happening, annual ear exams and hearing tests with an Ear Nose and Throat (ENT) doctor allow for better evaluations. Although these problems are not common, children (and adults!) with chronic ear infections may develop one or more of these severe ear infection complications. I am not talking about the temporary hearing loss that is caused by fluid buildup or swelling behind the ear drum that happens with routine ear infections. A persistent hearing loss may happen because of scarring on the ear drum, or scar tissue that builds up around the tiny hearing bones of the ear. This type of hearing loss is called a conductive hearing loss because sound has trouble reaching the hearing nerve. Conductive hearing loss can be treated with surgery or hearing aids. Again, I am not talking about a tiny hole that happens when an ear drum ruptures during a new ear infection. After an ear infection is treated, most ear drum ruptures completely heal. Chronic ear drum perforations become more serious problems when they fail to close up. The perforation may become large enough that the ear drum cannot move correctly. Ear drum movement improves the way sound reaches the hearing nerve. So, a large hole in the ear drum becomes another cause of the conductive hearing loss discussed above. Ongoing ear infections cause repeated episodes of ear drainage through an ear drum perforation. Chronic ear drum perforations are treated by repairing the hole with surgery. The mastoid bone, which sits behind the ear, is made of air spaces that help drain the middle ear fluid. When the mastoid cells become infected or inflamed, mastoiditis develops. Chronic mastoiditis is more difficult to diagnose because swelling slowly develops and ear pain is often not present. The trapped infection leads to severe complications because bone is slowly destroyed. The mastoid bone separates the ear from the brain. When bone erosion happens, chronic middle ear infections can spread causing meningitis or a brain abscess. Chronic mastoiditis requires surgical treatment. A cholesteatoma is a collection of skin cells inside the middle ear that can happen because of recurring ear infections. If it is not treated, a cholesteatoma can eventually damage many structures deep inside the ear. Symptoms of cholesteatoma can be similar to some of the other complications discussed. If there is a chronic ear drum perforation with recurrent ear drainage and hearing loss, a cholesteatoma may be present. In addition to slowly eroding the hearing bones and bones near the brain, the cholesteatoma can also erode the area with the hearing nerve, leading to the permanent nerve damage hearing loss. Damage to the nerve that moves the facial muscles can also occur. Cholesteatoma treatment always includes surgery. Ear infections are very common in childhood and most kids outgrow them. However, if children continue to have ear infections off and on as they get older, consider an ENT evaluation to be sure a more serious, slowly developing complication does not occur. Ear infections can lead to more serious problems and are not always as innocent as many people believe.